Klaus Ferdinand Hempfling talks to Jenny Eilander about why he likes to ride without reins, even though sometimes reins are better. More and more people today are searching for more friendly ways of riding horses. The Rollkur method and the use of reins, especially, has become a hot topic in this debate; a positive development since the use of reins in the wrong hands can cause much suffering to a horse. Recently, this became painfully clear when a video clip came out showing a horse during a warm-up session before a dressage competition, with a blue tongue. This was a direct result of the tightly held reins. Although the horse was clearly suffering, the organizers of the competition decided not to contest the action. This was an incomprehensible situation for many horse lovers. However, reins are sometimes important, and according to Klaus Ferdinand Hempfling, in some cases even indispensable. Klaus shows in his courses how it is possible to dance with horses without any external force and how a deep, trusting relationship with the horse can be built up while the horse keeps all of its dignity and freedom. Then why are reins for some horses still so important, and how should we use them? To find the answers to these questions we must first dive into the history of horseback riding, and explore where our contemporary way of riding comes from. KFH: Originally, in the time of baroque riding, there was the idea that the horse comes from the wilderness. The horse is wild, and in nature horses make certain movements and specific postures. 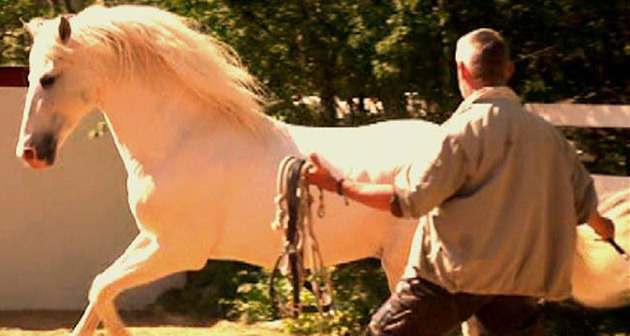 A stallion, for example, uses specific gaits to present himself, to fight, etc. The idea in the Baroque style of riding was to control the horse completely, but not to destroy his spirit. To control the horse in a way which is still respecting his nature, to bring out these natural postures and movements in riding, and so turn it into a very high level of art. Later on, also in parallel with the changing society, other ideas appeared. These are the fundamentals of his style of riding, and this is what we still see today in different forms. This is exactly what the so-called contemporary “rollkur” is all about; controlling the neck. The only difference is that Baucher still had some refined and sensitive techniques, empathy and feelings for the horse, which is nowadays often completely gone, and the only way to do it now is by pulling brutally on the reins. We have to realize that people who train and work in this way are “successful” according to their philosophy. They are “quicker” because they bring this technical flexibility into the neck of the horse and thus control the horse, even though they don’t know the underlying history and method. Klaus Ferdinand Hempfling riding Harmón. KFH: This way of training has a great physical and psychological impact on the horse. The horse is deprived of all of his dignity, it is painful, and because of the position of the head, the horse cannot see. It is unnatural, and has nothing to do with the natural movements of the horse. The breathing is hindered, the blood pressure is higher, the heartbeat is higher, and the horse is in a constant state of panic. Furthermore, the horse has no way to escape from this squeezing system. This “breaks” the dignity of the horse and for this reason 70, 80 and 90% of the horses that I am receiving now in my courses are depressed. They are not beaten like before, but the dignity and self-respect of the horse has been taken away from them completely. This is the reason why I now have more and more horses “without souls” in my courses, and once the soul has been broken you are only left with a machine which is working, functioning, but there is no sparkle left in their eyes anymore. They are lost in themselves and the life is gone. They are literally standing with their noses in the dust. Sometimes this is an almost impossible job, and it takes a lot of time. They are dead inside. They were dead inside and while I can bring them back to life, it takes time, and I must be very careful. It takes a long time before they are halfway stable again, and then you still have to be very careful because with only small things, you risk that the horse will fall back into his depression. What are the alternatives? Can we lead a horse to the highest level without using reins? When we watch clips of Klaus riding his horse Janosch we see him without reins at all. KFH: It is very seldom I use any kind of reins whatsoever because often they are completely ineffective. When you see me riding Janosch, you can see that the horse is perfectly in balance by himself. This horse does not need reins. However, when you see me riding Yunque, you will never see me riding without reins – for sure, often only with a simple halter without a bit – Why? – because this would not be good for this horse. I will have to explain this more deeply. If we look back to a native, natural horse, then this horse is built in a particular way. It has a typical balance between the shoulder, back, neck and croup. We can still find this specific conformation with, for example, Welsh Cob ponies and Camargue horses. If we look at the contemporary sport horse, jumping and dressage horses, Spanish and Portuguese horses, we find different proportions. They have a long neck, they are slimmer and smaller, and when you see these horses running or walking on their own you’re always getting the feeling that they are running on the forehand. There are many pictures of this in my book The Horse Seeks Me, I have pictures where the horse is running alone and pictures where I am supporting him. In these pictures, you can see very clearly that when he is on his own, he is walking on the forehand. What I do when I am working with these horses, is placing so much interest and so much focus, almost in an exaggerated way, on the hind legs, that the horse is in a way encouraged just to bring his neck closer towards the body and so bring forth a more collected way of moving. The point is, that these horses over hundreds of years, have been bred in a different way, and so they are now built completely differently than the native horse types. They are rebuilt in such a way that they need a ‘fifth leg’ in front of them so to speak, and so it is not good to ride these horses without reins. They need the reins, otherwise they feel lost. This is something we have to realize; we have to look very carefully at our horses and really try to see what they need. I understand perfectly someone who says: “I would like to come back to a very natural way of riding, and I do not use reins,” because that person looks at reality and knows that in almost 100% of the cases reins cause pain, and this is true. Furthermore, we have to consider the other side, which means that these horses need an extremely refined technique that will enable them to be supported by an always loose rein. Why, because we need to support the horse with the reins and because the horse benefits from it. I would not like to ride horses like Queijo, Harmón, Harbon and many others without reins because by themselves, they no longer have the natural balance that the native, authentic horse has. How should we then use the reins if we don’t want to pull the horse into a certain position but to reach this balanced and collected state? Even if my reins hang very loose, they always have to be there. The horses need the reins because the whole system of riding with reins is incorporated into the breed of the horse. The only thing is that when you’re starting to work with these horses, you have to start with encouraging them to use the hind legs. Then it’s not necessary to pull the reins and cause them pain. This is by the way, also the real way of baroque riding. If we look to the whole picture, then the horse is long, wide, runs with an under neck and the head is more or less “lost.” You can see that the horse is not happy in such a situation. The horse needs the rein, and when used in the right way, is happy with the reins being used in this kind of way. So, we must bring ourselves to the level where we use the reins only as a signal for the memory of the horse. This article first appeared on Horseatlk.co.nz in March, 2010. Not buying this I’m afraid. All horses and all breeds can and should be taught to move in self-carriage, with no reliance on the reins to maintain a body posture. Regarding the comment from Rachael: I ride without reins or saddle, and sometime I will use a rope around the neck, but no bits. I am not a seasoned or know it all rider by any means. In fact I have had very little training. Those that tried to train me their ways, depressed me. I felt the horses pain. I do what feels natural to me and the horse. I feel what the horse wants. When I am on their back, my body and that of the horse become one. Based on my body language, the horse knows where to go and what I am asking. I don’t feel the need for external tools that cause pain. I use no saddle. Horses are telepathic as are some humans. They can sense what you are asking by your own body language. They do not need to be taught anything. It is the humans that mess them up. I have seen it so many times. Imagine you had a heavy saddle binding your girth and on top of that you have over 100 lbs of human bouncing around on your very sensitive back because they have no clue how to blend with you and become one with you. They don’t deserve to be dominated by humans that are seeking pleasure, fame and money at their expense. Klaus Ferdinand Hempfling is the ultimate horseman. He knows the horse and respects and loves them and does not cause them pain. That is why he is so successful. Perhaps someone should teach you how to move in self carriage and see how you like it. Self-carriage means that the horse is able to maintain balance, speed, tempo etc all by itself, without being forced or nagged into it by the rider or by equipment. I think you are reading something different into my comment….